Happy National Caviar Day! 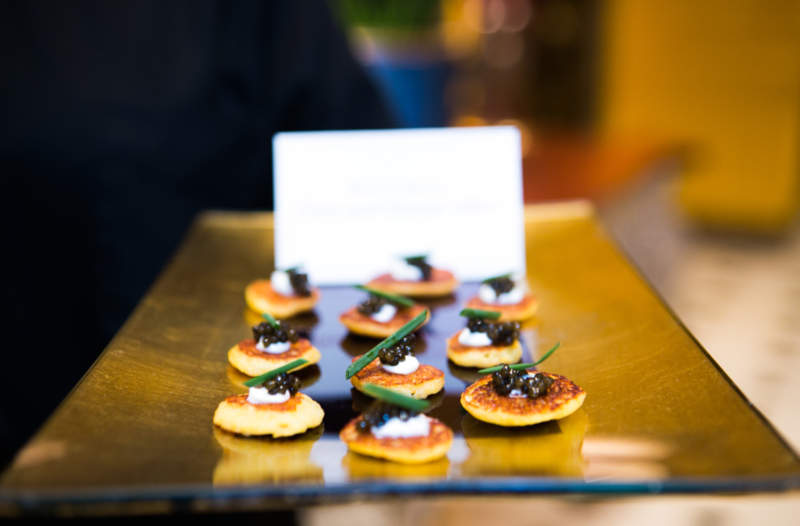 Caviar is one of our favorite items to add to your menu to bring an extra touch of elegance to any event. In honor of National Caviar Day, we would love to share some fun facts, recipe tips and secret tricks to our favorite menu item! When most people think caviar, they think of the traditional caviar display possibly seen at their grandmother’s house on Christmas morning. Caviar on ice, warm blinis, crème fraiche, red onions and hard boiled eggs all presented in silver bowls with small mother-of-pearl spoons. While this always creates a beautifully traditional display, HMNS loves to think outside the box and add our modern take on things for functions, parties and more. Corn and Caviar Blini: Warm blini topped with caviar and crème fraiche. Garnished with chives. Combine all of the ingredients, except for the butter, and blend in the Vitamix. Emulsify the blend in the butter. Cook small cakes on a griddle or cast iron pan. Top cooked blini with lemon crème fraiche, caviar and minced chives. 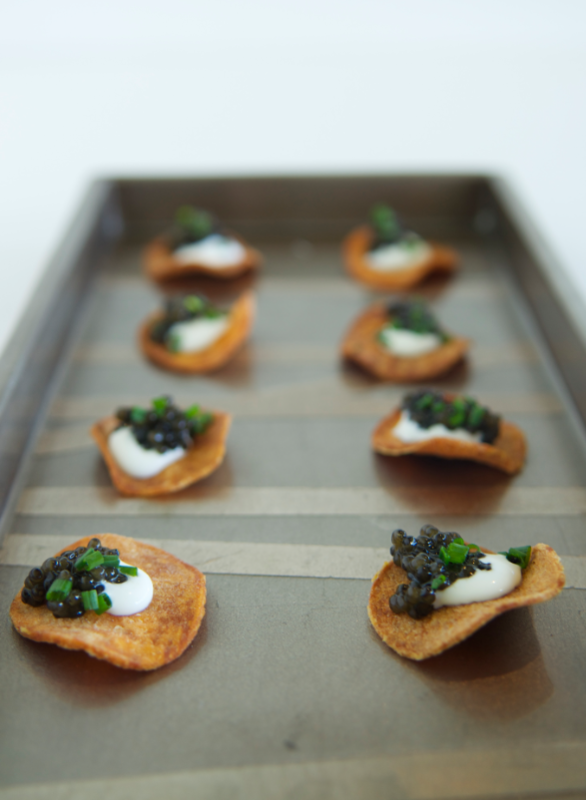 “Fare-ly Sweet” Chips and Caviar: A Fare Extraordinaire brand sweet potato chips topped with lemon crème fraiche and caviar. Garnished with chives. Assemble as desired. Use photo as serving suggestion. Who says caviar is limited to savory bites? 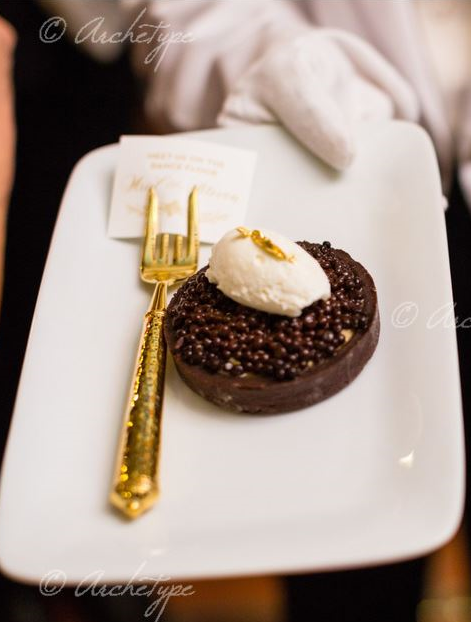 Another unique and creative way to incorporate caviar into your menu is through your dessert! Caviar has been trending in the pastry world, and we would love to share one of our new favorite desserts with you. Our Chocolate Caviar Tart will make your mouth water! Our pastry department has been working to perfect the art of chocolate caviar for this fun-filled tart. As simple and small as caviar may seem, there are many origins and differentiations. The more you learn about caviar, the more interesting and enjoyable it becomes to eat. Caviar, in the most basic explanation, is a salt-cured fish egg originating from a sturgeon fish. There are four types of caviar: Beluga, Starlet, Ossetra and Sevruga. The rarest of these four is the Beluga. These sturgeons are located in the Caspian Sea between Europe and Asia. At A Fare Extraordinaire, we prefer to use the roe from Ossetra Sturgeon. This caviar is the most prized and expensive next to the Beluga. 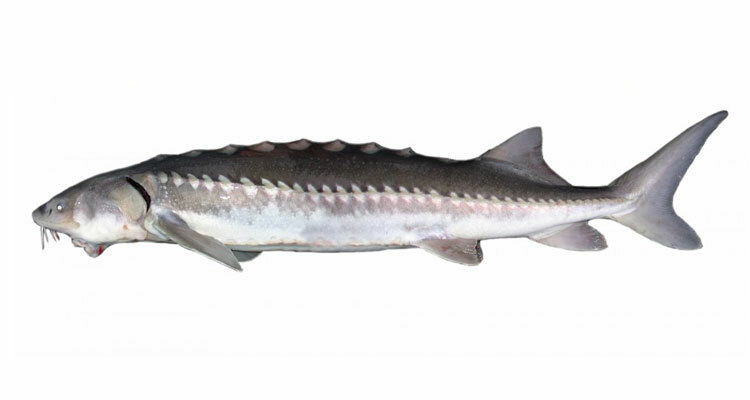 The Ossetra Sturgeon range from 50 to 400 pounds and live up to 50 years in age. The Ossetra caviar ranges in color from deep brown to golden. The lighter colors are more sought after because they are the richest in flavor. We hope that these recipe tricks, sweet treats and fun facts have helped broaden your caviar knowledge and helped you in celebrating National Caviar Day! Editor’s Note: A Fare Extraordinaire is a luxury full-service event and catering company servicing the greater Houston area, and a partner of the Houston Museum of Natural Science Special Events team. Educator How To: Make Your Own Ancient Chinese Compass!